DNA, has a deoxyribose sugar — phosphate backbone with the purine and pyrimidine bases, adenine, cytosine, thymine, and guanine connected to the deoxyribose sugar. (The base–sugar molecules are nucleosides, and those with phosphate, nucleotides.) In the double helix structure of DNA the two strands are twisted and connected by hydrogen bonds between the bases. How is this "twist" created in the cell, and why is it necessary? First, your description is accurate. The only pedantic critique I would make is that the technical term for nucleotides in DNA is deoxyribonucleotide. Second, I don't want to say that non-helical DNA never occurs since the structure of any macromolecule is dynamic, but I am specifically avoiding exceptions to the rule to avoid confusing the issue. The helical structure of DNA is a low energy form which makes its formation thermodynamically favourable. Chemical bonds in DNA (and every molecule) have conformational flexibility which means that the molecule as a whole can adopt different structures. 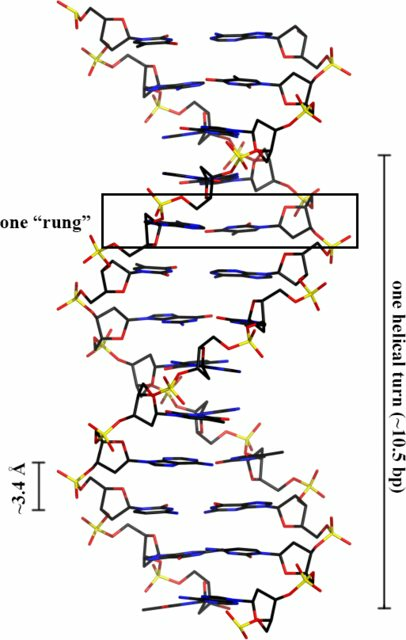 If you picture two DNA strands joined by hydrogen bonds but in a non-helical, straight form, you can simply twist the strands about their central axis to form a helical structure. This twisting is allowed because of the conformational flexibility of the chemical bonds. The helical structure is more stable than the "straight" form (because of base stacking interactions), and so it forms spontaneously. I struggled in vain to find a good animation of this, but came up short. You can skim through this video to see an example of what I'm talking about. It's subtle, but you may be able to see, or conceptualize, that as the two strands are twisted around each other, the adjacent bases in a strand come closer together. This permits stabilizing interactions between the adjacent bases which favours spontaneous helix formation (I briefly discuss this at the end of another answer). One key point for someone coming to structural biology from another disciple is to understand the basic thermodynamics underlying the concept of ‘stable’ structure. This is described in an introductory chapter of Berg et al. online. Although it is strictly necessary to consider the entropy of the total system, in many cases the most important factor is the (Gibbs) Free Energy of a structure. If one compares two (or more) structures, the most thermodynamically stable is the one with the lowest free energy. The reason for the ‘twist’ that is the basis of the helix in the DNA is simply that it is part of the structure that allows the strongest hydrogen bonding and base stacking with the lowest amount of steric or electrostatic repulsion. This will be the structure with the lowest free energy. Not the answer you're looking for? Browse other questions tagged biochemistry dna structural-biology 3d-structure dna-helix or ask your own question.